In the Premier League table, Arsenal and Watford are only one place apart, holding 13th and 14th respectively. In the third round, Arsène Wenger must reignite his Gunners if they are to get a first victory when they face the tricky task of playing away this Saturday. Last season, Arsenal won both league games against Watford, but suffered a frustrating 2-1 loss at home in the FA Cup. 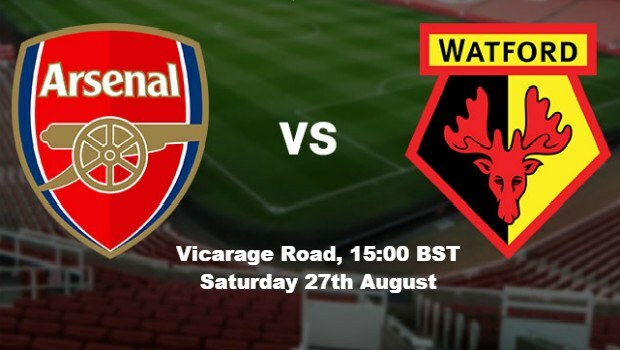 So the Gunners should be wary of travelling to Vicarage Road and expecting to claim all three points. At Watford, the early storyline is how new manager Walter Mazzarri will adjust to the Premier League, having previously managed five teams in Italy’s Serie A. The 54-year-old took over from former manager Quique Sánchez Flores, who was sacked in May 2016 despite guiding Watford to 13th place in their first season back in England’s top flight. So far, Mazzarri has had a mixed start, with his first game being a respectable 1-1 draw away to Southampton. Mazzarri could take confidence from claiming a point with ten men against a Southampton side that finished sixth last season. Next up was Chelsea, with Watford again taking a 1-0 lead before being pegged back. Watford managed to hold out until the 80th minute, when new Chelsea striker Michy Batshuayi tapped home an equaliser. A stunning Cesc Fàbregas through-ball then opened up the Watford defence for Diego Costa to score the winner. Despite claiming just one point, Watford could take heart from challenging better opponents and nearly upsetting them. However, Watford’s momentum was halted by a demoralising 2-1 FA Cup home loss to League One opponents Gillingham. Following the defeat, midfielder Abdoulaye Doucouré said Mazzarri did not speak to the players. Avoiding the squad might not benefit communication, especially when the Italian is using an interpreter for his media interviews. Considering the difficulties facing Mazzarri, NetBet has priced Watford at 15/4 to beat Arsenal. Arsenal’s 4-3 defeat to Liverpool was the most thrilling opener, but the cost for the Gunners was starting the season without a point. At one stage, Arsenal were faced with an embarrassing 4-1 scoreline before Alex Oxlade-Chamberlain and Calum Chambers brought the team back to 4-3. For Arsène Wenger, defence was the obvious area of weakness, with the Frenchman starting Chambers and new signing Rob Holding as a makeshift partnership at centre-back versus Liverpool. Ultimately, Wenger was forced into the decision after summer injuries to Per Mertesacker and Gabriel Paulista, while Laurent Koscielny returned late from Euro 2016. Amid the injury crisis, Wenger is said to target Valencia centre-back Shkodran Mustafi, but his club claims the German World Cup winner is not for sale. Even without Mustafi, it did not stop them from keeping a clean-sheet in a 0-0 draw with Leicester last Saturday. In fact, the latest performance suggests Arsenal lack creative quality. Mesut Özil would be the obvious solution, having generated an impressive 19 assists last season, but the German international is still regaining fitness after an extended break following the Euros. So far, Özil has only featured from the bench in the Leicester game, but Wenger is hopeful of the attacking midfielder playing longer against Watford. NetBet is offering Arsenal at 20/27 to win on Saturday, with the Gunners boosted by Koscielny’s defensive return against Leicester. With an experienced defender in the first XI, Arsenal were not as vulnerable as in their opener. Meanwhile, Watford would be worth 15/4 if they could upset the Gunners. Alternatively, punters can consider the draw at 53/20, as Arsenal striker Olivier Giroud is another player short on fitness after the Euros. Wenger chose to play with Alexis Sánchez as the front man versus Liverpool and Leicester, but the Chilean winger was unable to contribute any goals or assists. With Wenger still needing a win, he could feel pressured into starting an under-fit Giroud. If it pays off, then Giroud would be worth 9/2 to score first or 27/20 anytime. Another man to watch could be Watford striker Troy Deeney, who found the net in the Southampton game. For Deeney, NetBet is getting generous with 29/4 to score first and 47/20 anytime. Total goals could be an interesting market after both team’s recent struggles, with NetBet offering 20/23 for under 2.5 goals, while optimistic punters can get 4/5 for over 2.5. Meanwhile, the odds are 20/21 when backing no for both teams to score, which could be possible if this is an edgy game. For all the latest Watford vs Arsenal betting markets, visit NetBet today!